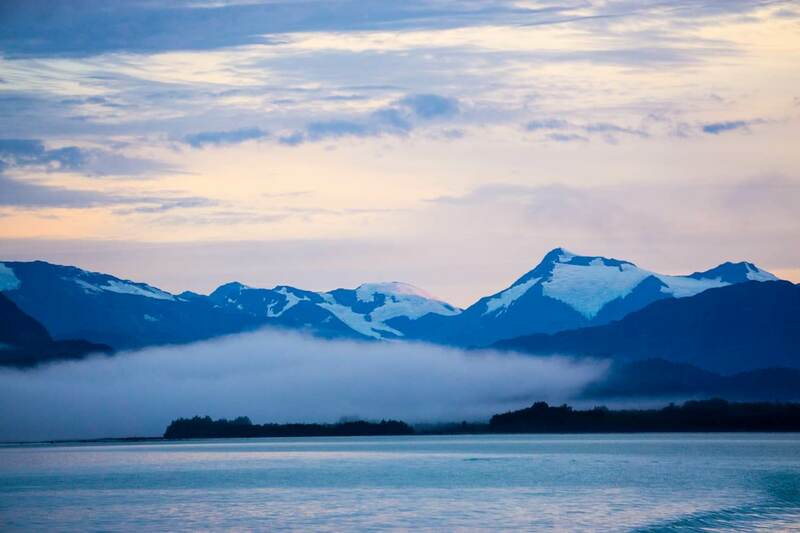 A truly magical place, a tiny town surrounded by countless glaciers and the blissful quietness. 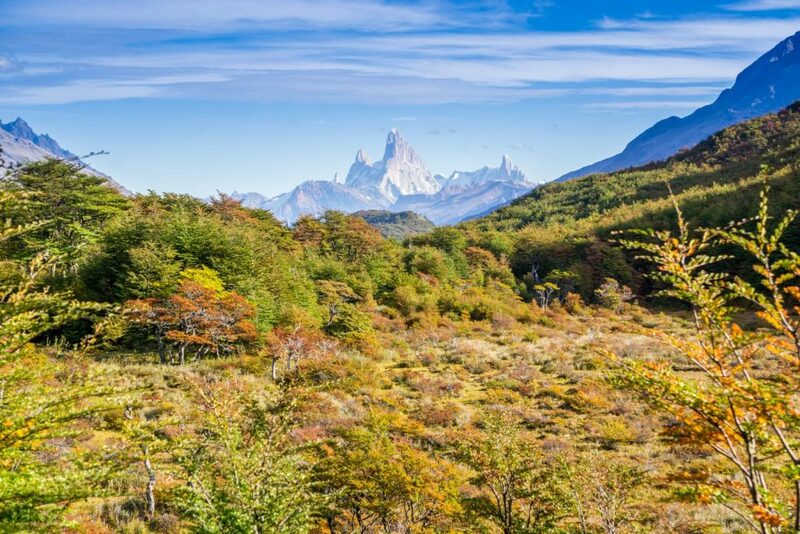 That is Villa O’Higgins in a remote part of Chilean Patagonia. 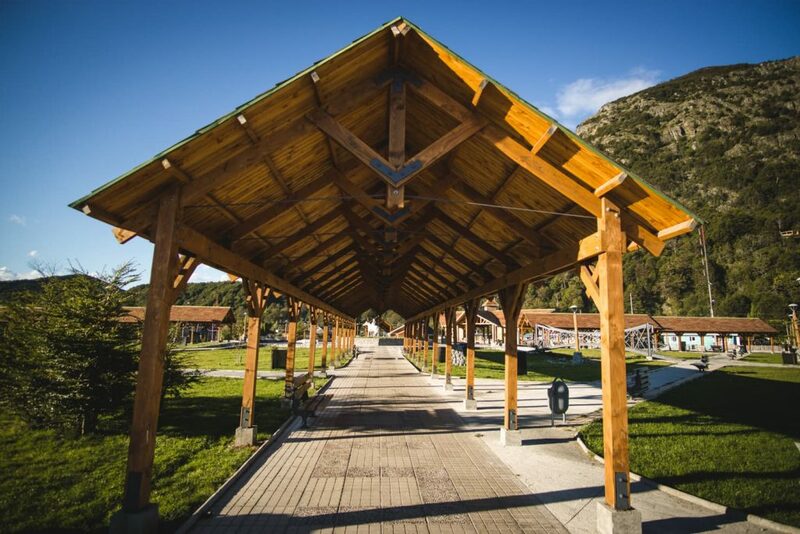 Where famous scenic road Carretera Austral ends and travelers embark on a tough journey – the Chile-Argentina border crossing. 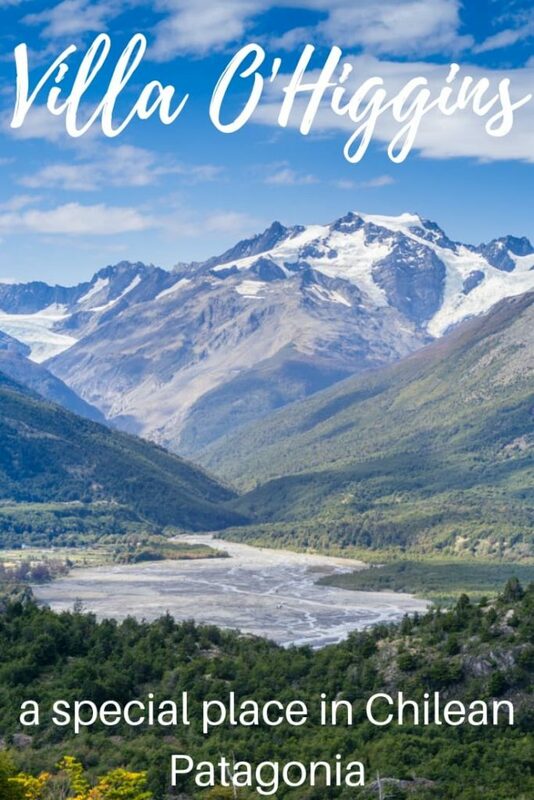 This post talks briefly about our journey to Villa O’Higgins, what the town is like, why I call it a magical place and what you can do there, as well as the detailed description of the border crossing from Villa O’Higgins in Chile to El Chalten in Argentina. Michal and I visited Villa O’Higgins at the end of our hitchhiking adventure along Carretera Austral. 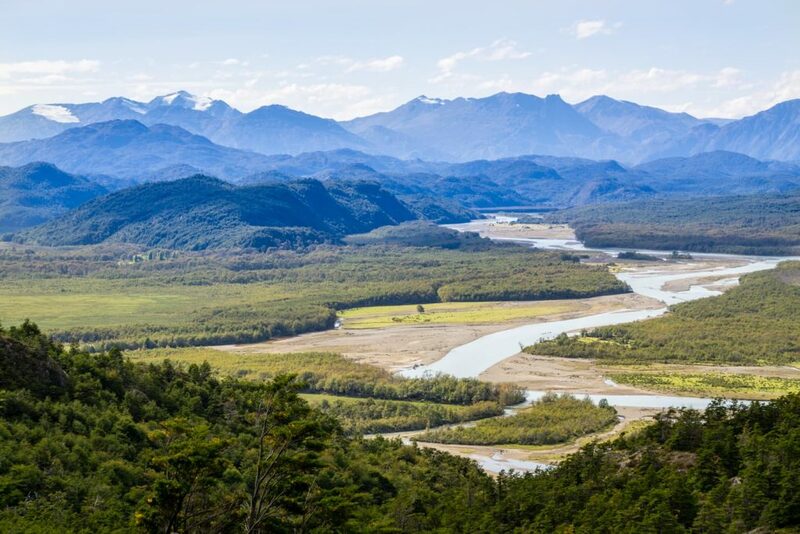 We’ve hitchhiked the full length of Carretera Austral except for the last part, from the Yungay/Tortel crossing to Villa O’Higgins. While trying our luck with thumbs up, a small local bus stopped by and we happily paid 2,400 pesos each in hopes to catch the last ferry of the day. Since the road ends in Villa O’Higgins, not many cars are heading that way. 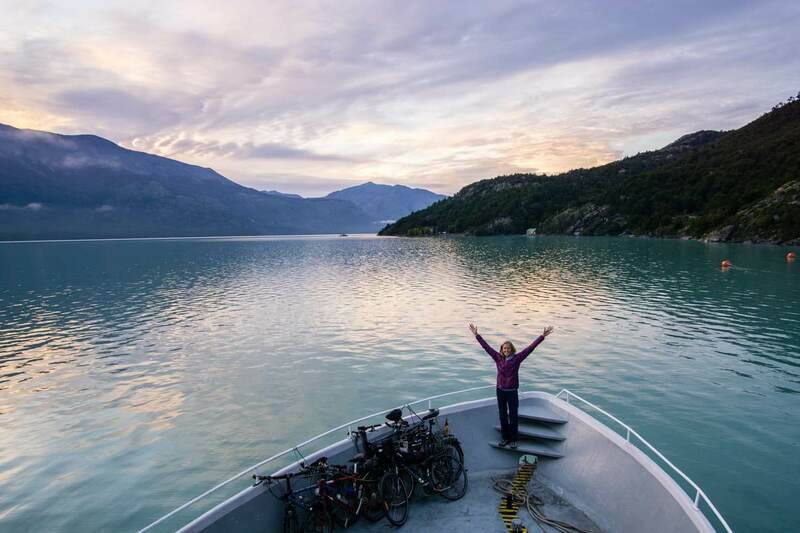 From the end of the ferry ride to Villa O’Higgins, we were in for a treat. I’ve never seen so many glaciers in my entire life! The entire bus journey we kept looking out all directions trying to see them all. It’s a spectacular end. And not just end of the day, but of the entire Carretera Austral trip. When we stepped off the bus, it was dark, foggy and cold. The hostel with a smoke coming out of the chimney was a promising possibility of having a nice place to sleep. In late March, it was the coldest place so far and we’ve chosen to stay in a hostel after two weeks of camping. 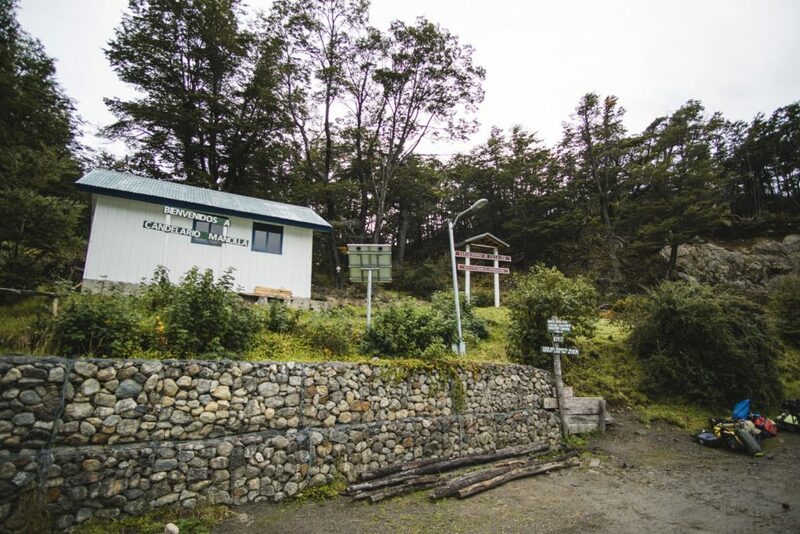 Hostel El Mosco turned out to be a big cozy cabin with a fireplace full of friendly and outdoor loving people. We passed by a few people heading out for an overnight hike the next morning. The hostel has plenty of private and dorm rooms, cabins, a big kitchen and common area, library & maps, and wifi. This hostel can’t be booked through Hostelworld or booking, you can book it in advance here. Or just show up and they’ll have a place for you. 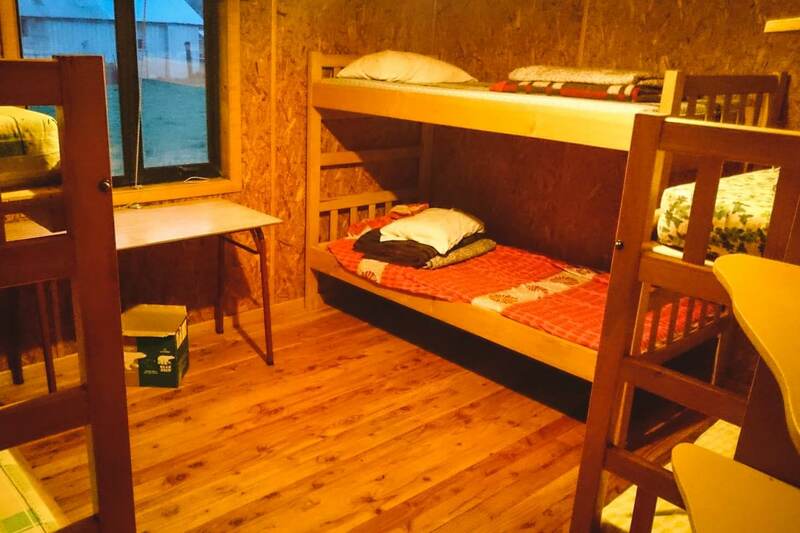 It costs 12,000 CLP (18 USD) for a bed in a dorm room and 5,000 CLP per person for camping. 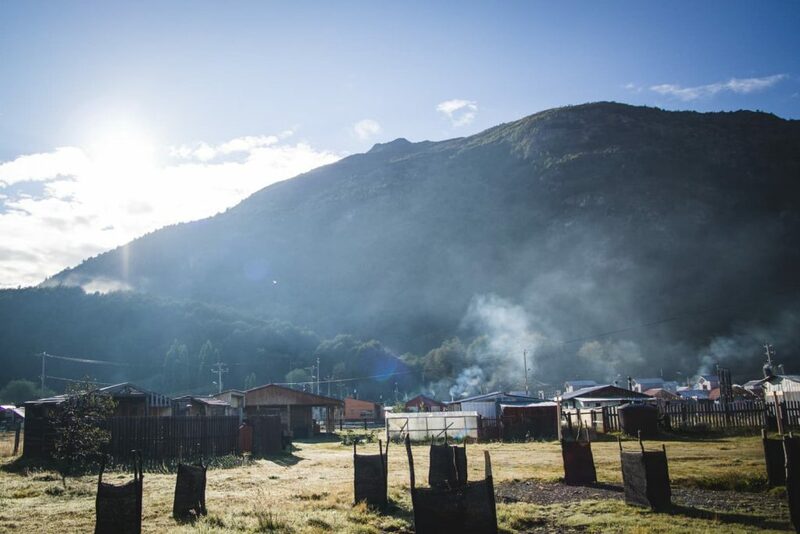 The mornings were highly anticipated for us in Chile. Wherever we went, the bakery had fresh pastry and let me tell you, you won’t find more delicious bun anywhere else in South America. Due to the influx of European immigrants’ years ago, they now make European pastry in Chile. After we filled our bellies, the morning fog disappeared and looking at all the glaciers around us, we decided to chill out here for a day before the strenuous border crossing. 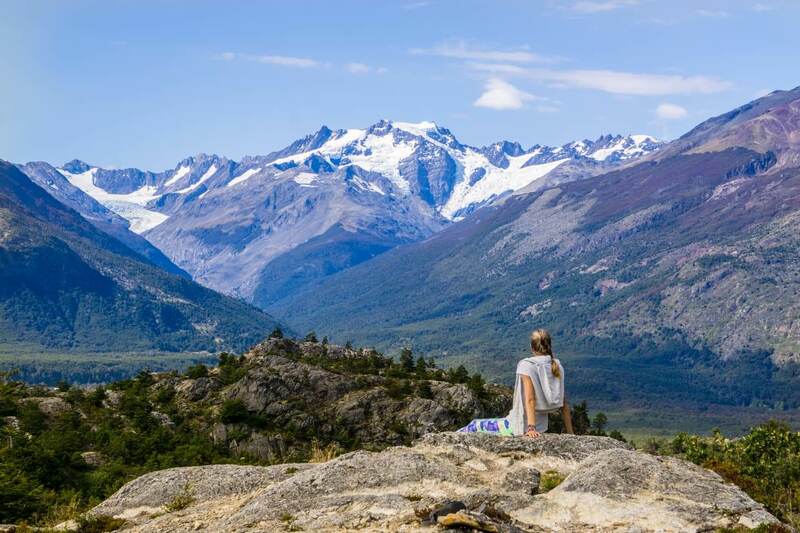 The hostel volunteer suggested to us a hike to see glaciers Huemul and Mosco from a viewpoint. 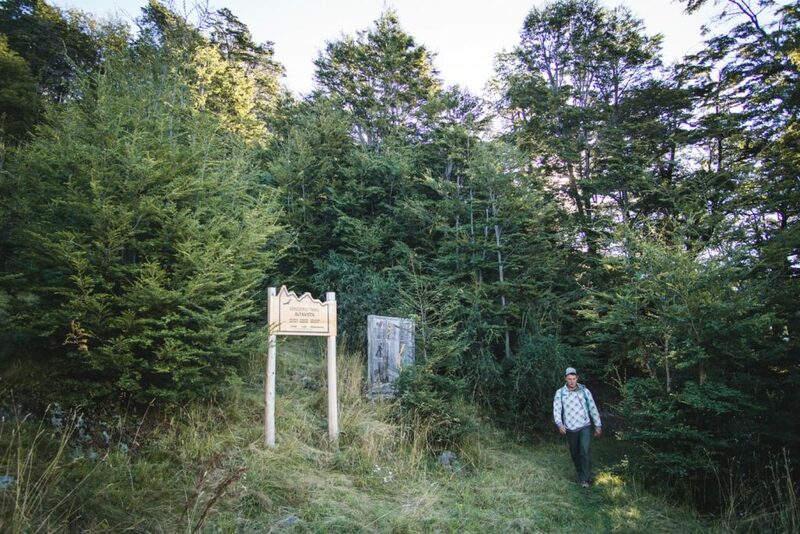 Altavista trail starts only 3 kilometers south from the village. Right after the bridge, there is a sign on the right which says ‘Sendero trail Altavista’. Although it’s behind the fence on the privately owned land, the hostel volunteer said it’s ok to go there. We hiked through the forest, gradually going uphill. The view starts to open up as we hike above Lago Ciervo. 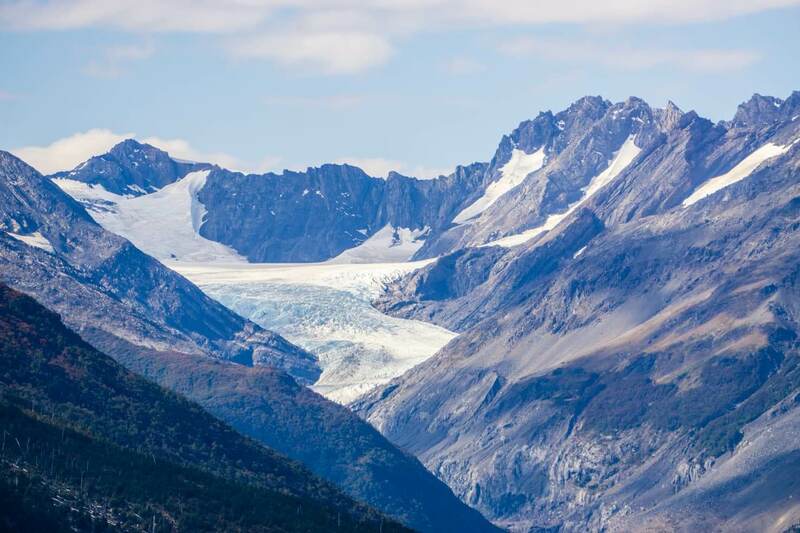 It’s hard to count how many glaciers you can see, they are literally everywhere. Unsure where the end of the hike is, we covered around 8km and stopped for lunch. The view is just out of this world breathtaking. 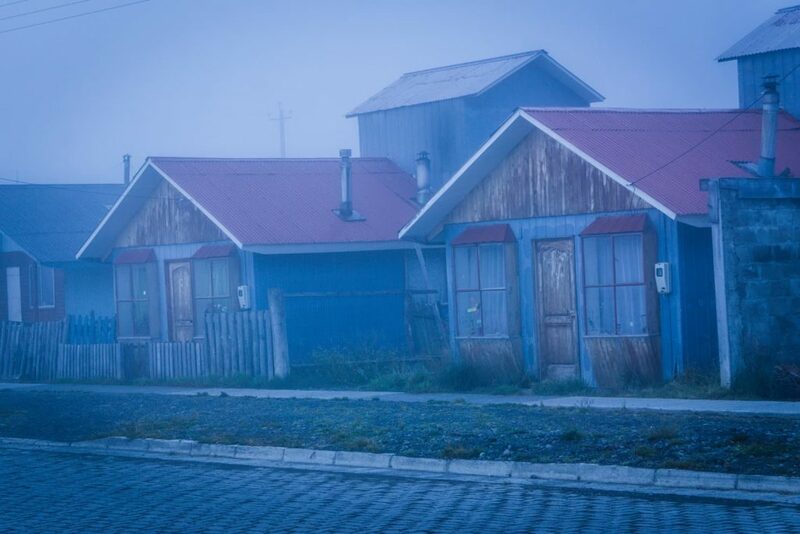 Travelers with a car usually go to Tortel and either turn around or take a ferry south to Puerto Natales. 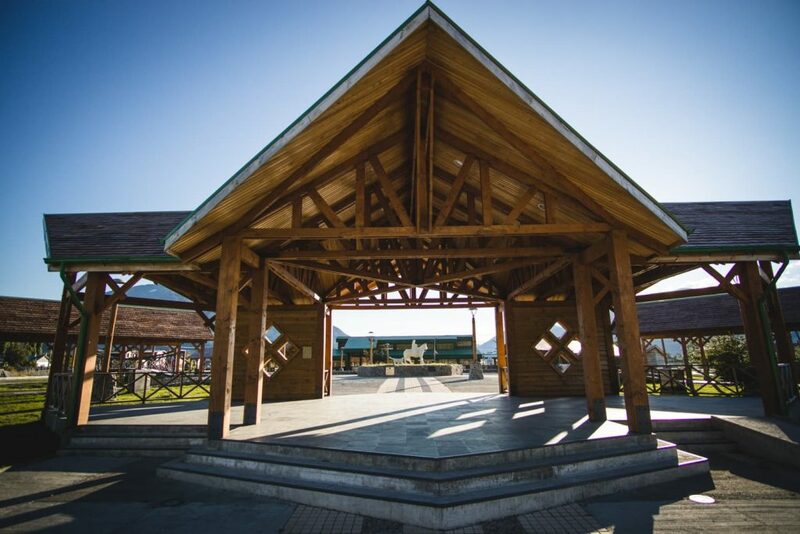 If you’re traveling by public transport, there is a shuttle bus from Cochrane going to Villa O’Higgins. It only departs a few days a week and costs around 20,000 CLP (30 USD). Along Carretera Austral we found the most enjoyable way was hitchhiking. It gives you a big sense of freedom and tranquility (since you can’t just hopin your car and go). 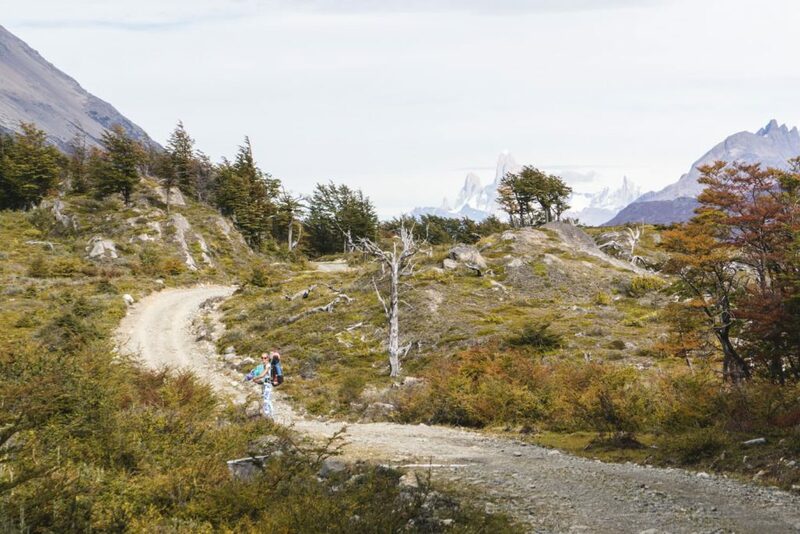 In such a remote part of Patagonia, you will find there’s no rush to get somewhere and people are living slowly. Locals here are used to travelershitchhiking and we never had to wait more than 1,5 hour for a ride. If you’re driving, I recommend not skipping Villa O’Higgins, even when you will have to come back (the road ends in Villa O’Higgins). 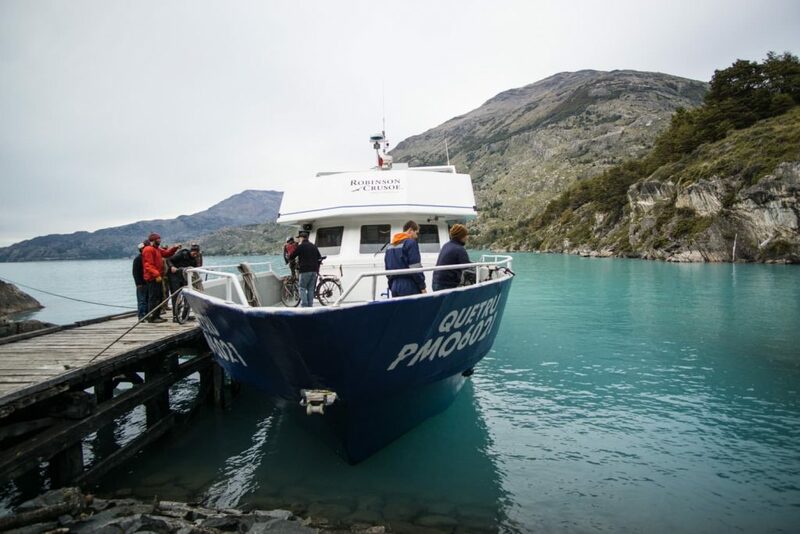 The ferry from Puerto Yungay to Rio Bravo (towards Villa O’Higgins) departs at 10 am, 12 pm, 3 pm and 6 pm from December to March and at 10 am, 12 pm and 5 pm in November. Check ferry times at your last accommodation before you leave. The ferry is free of charge. There are two small grocery stores where you can get basic food and some camping supplies. Despite this, we ate our weight in fresh pastry and bought 20 buns just for our 2-day border crossing (yay for carbs and easy energy). To our surprise, the stores in Villa O’Higgins were more stocked and also MUCH more affordable than in El Chalten in Argentina. There are also a few restaurants in Villa O’Higgins but since we cooked in our hostel, we didn’t try them. The average price for dinner is around 7,500 CLP (11 USD). You can find reviews of restaurants on Tripadvisor. There are no ATMs in Villa O’Higgins, the closest one is in Cochrane. 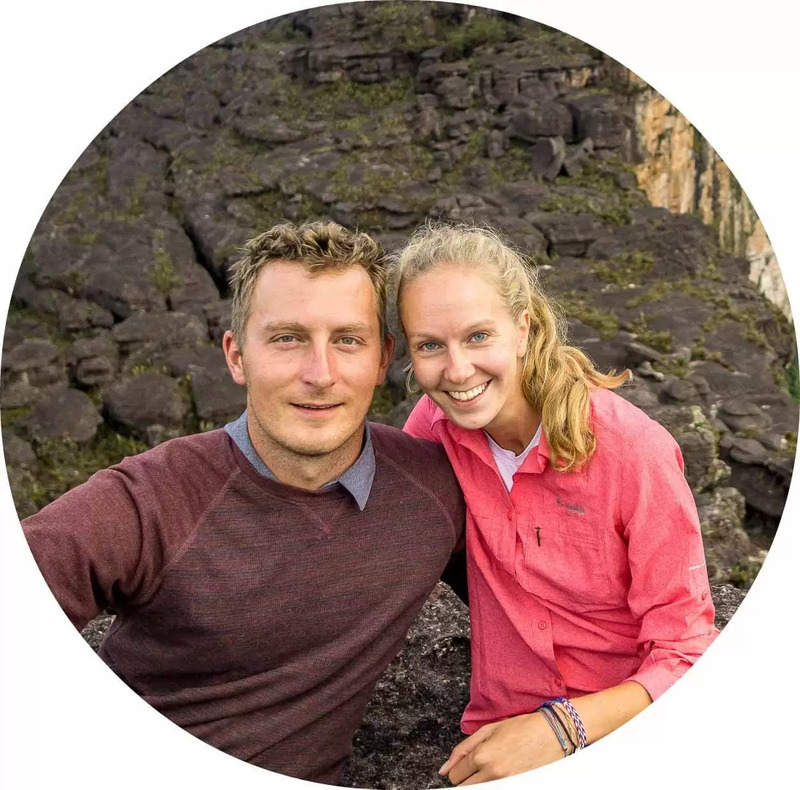 Although our hostel only accepted cash, we were able to use our Visa credit card in the grocery stores and also to book a boat for our Chile – Argentina border crossing. Budget-friendly – the most affordable option would be the already mentioned Hostel El Mosco which offers rooms and campsites. 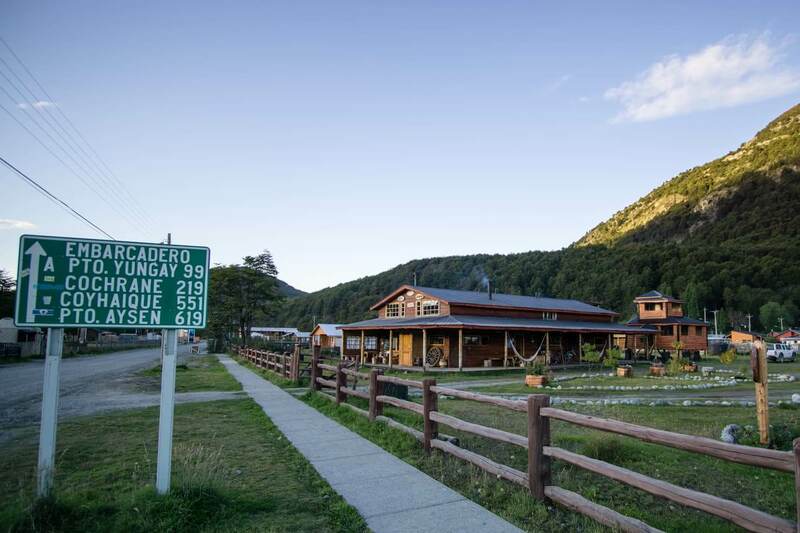 Middle range –Cabanas San Gabriel (for 80 USD per room), featuring private rooms, some with kitchen and oven and an on-site restaurant. You can find a few other options on this website. The journey from Villa O’Higgins in Chile to El Chalten in Argentina is just over 100km long but far from a traditional border crossing. You need at least one full day, or most commonly two days. This truly is for adventurers, patient andopen-minded travelers. 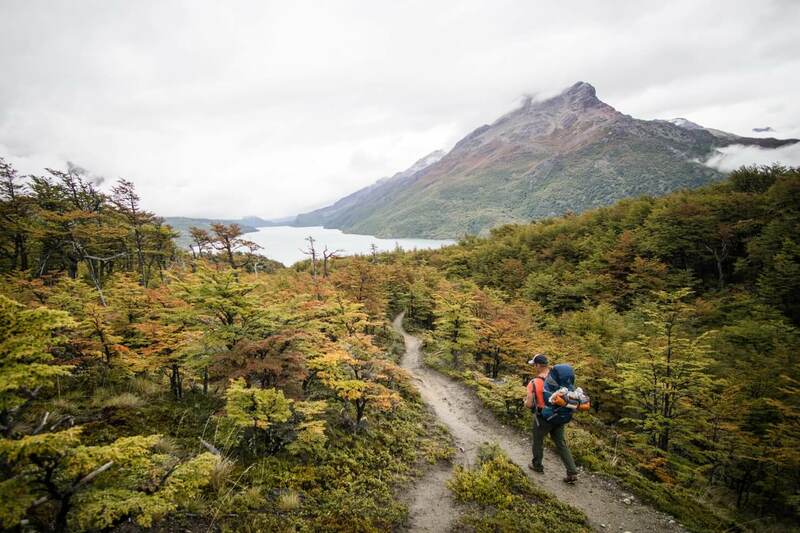 What begins on day one, might turn into spending a night somewhere between Chile and Argentina and continue the next day. 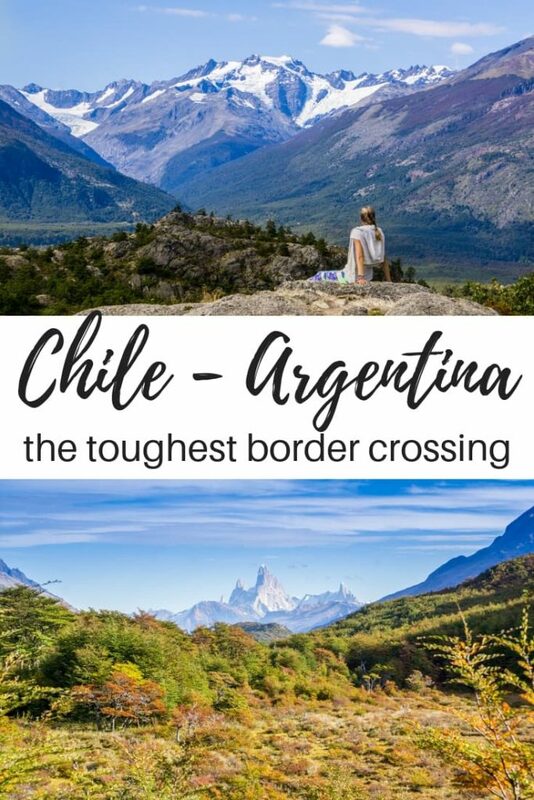 It is one of the most remote and wild border crossings used only by 4000 travelers a year. 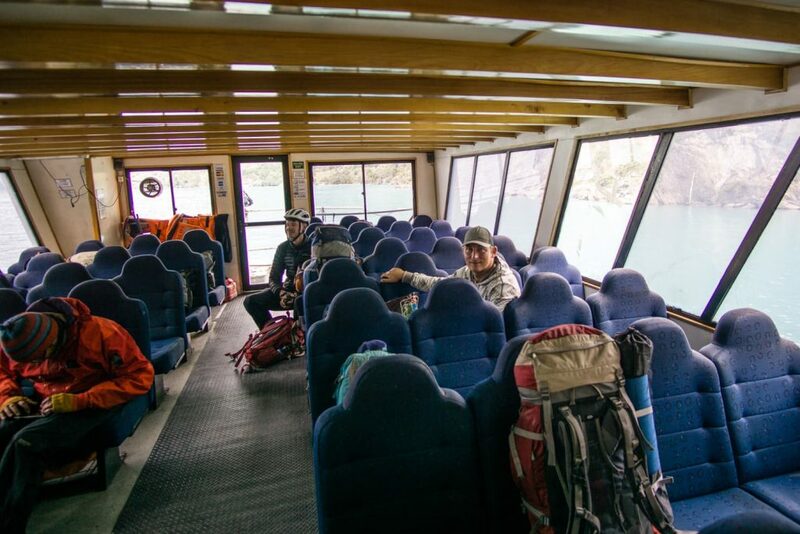 Crossing from Villa O’Higgins to El Chalten is only possible October to April and boat schedule is weather dependent. There are 2 boat operators who can take you across the lake: Las Ruedas and Robinson Crusoe. They usually operate 3 to 4 times a week (and only once a week in October and April). We asked both but only Robinson Crusoe had spaces available for us. The departure was scheduled in two days so we gladly enjoyed the quiet time in Villa O’Higgins. You can visit their websites (linked above) to purchase boat tickets in advance or visit their office in Villa O’Higgins when you arrive. We left in the dark to the port and witnessed a beautiful sunrise over the lake. There was only one traveler on foot except the two of us and around 10 cyclists waiting for the boat. 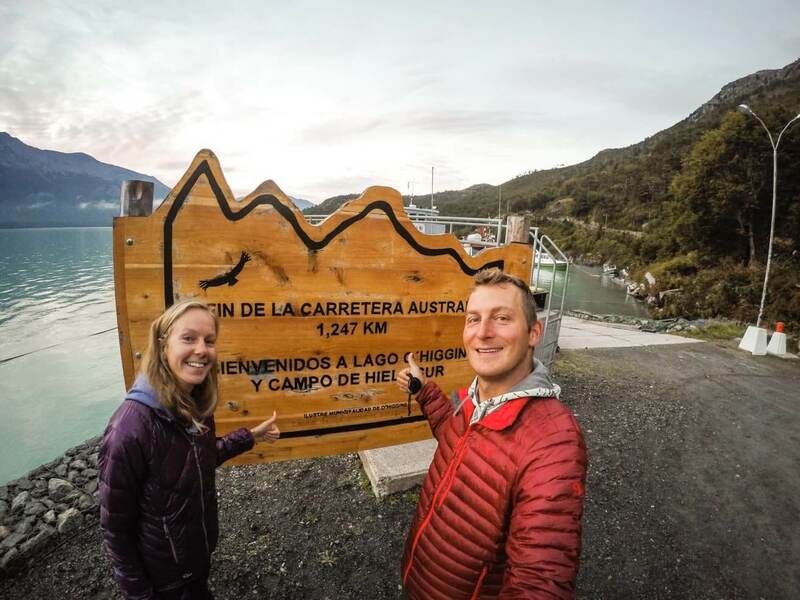 Once we took the ‘mandatory’ picture with ‘The end of Carretera Austral’ sign, we were ready to take off. The port is around 7km from Villa O’Higgins. When you purchase the boat ticket, you can also book the bus to the port.Price for 2018/2019 season is 2,500 CLP per person (3,70 USD) and the bus leaves 7:30 in the morning. 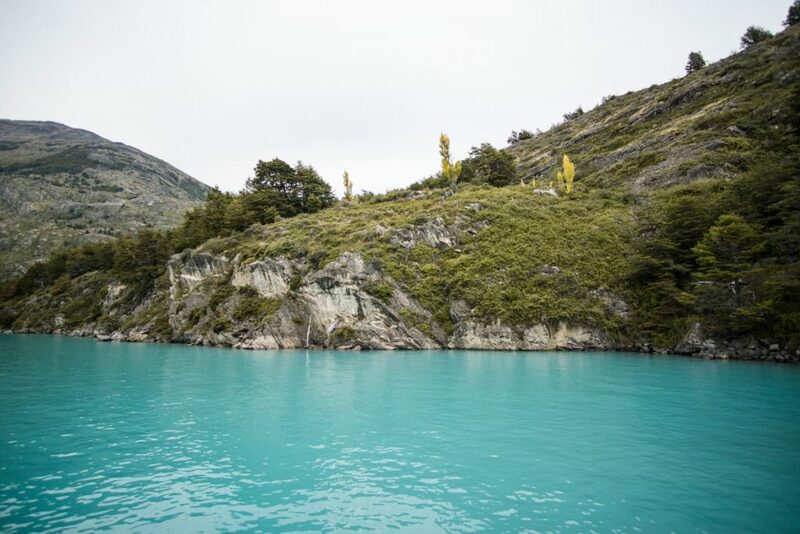 The Lake O’Higgins has unbelievable turquoise color. There were mountain peaks and glaciers all around us as we crossed the lake. It was a magical morning. Although it was a bit chilly on the boat, there was a little kitchenette where all of us rotated to make some tea. 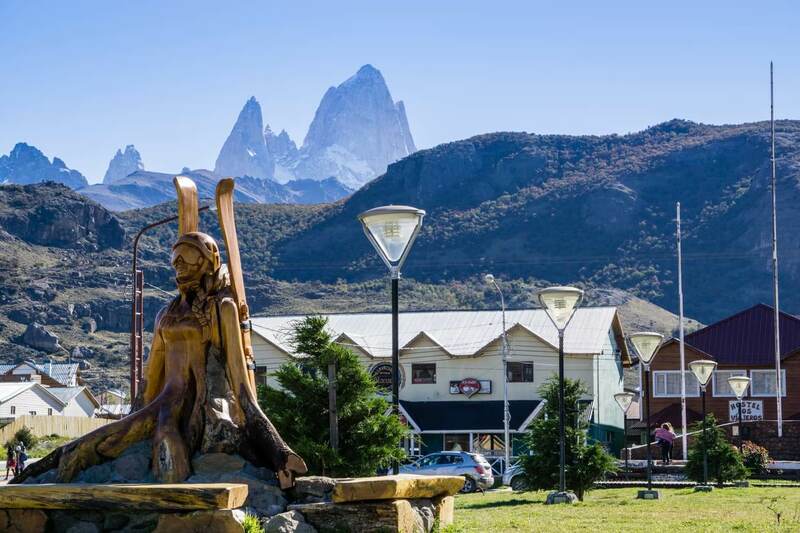 We could already see the famous Fitz Roy peak in Argentina from the boat. 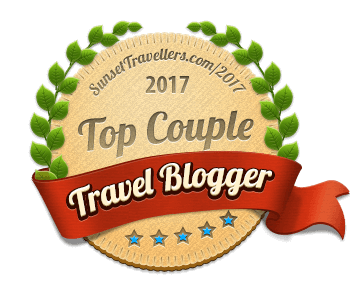 We arrived at Candelario Mancilla in 3 hours and asked about the horse transport for our luggage which is sometimes available. Since they only had 1 horse (for 1 luggage only), we decided to start walking without it. After around 1 km, we arrived at Carabineros, the Chilean immigration for our exit stamp. We’ve heard that ¼ of travelers forget to stamp their passports. Once they arrive at Argentinean immigration, they have to turn around and hike back and forth that 20 km again, just for the Chilean exit stamp. The boat departs at 8:30 in the morning, the price for 2018/2019 season is 36,000 CLP per person (54 USD) and crossing the lake lasts about 3 hours. 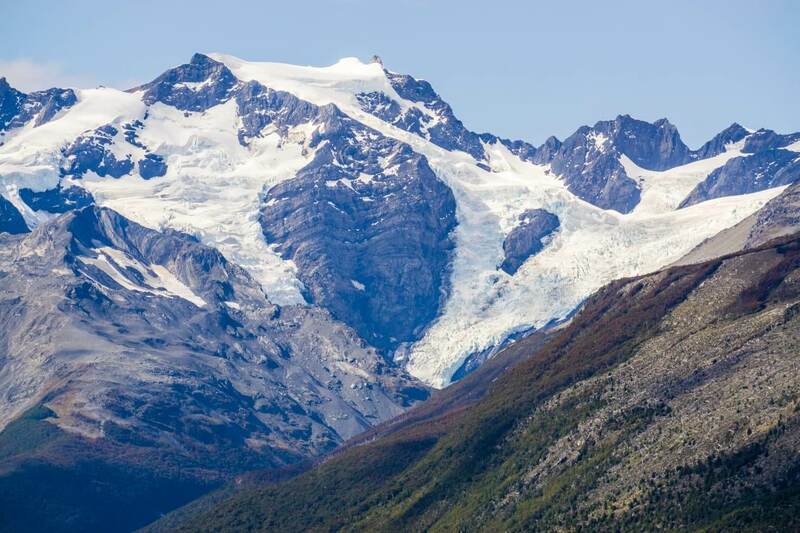 From Candelario Mancilla, it’s possible to take a boat tour to see Great Glacier, then stay overnight at Estancia or camp, and continue border crossing the next day. The first 6 km goes slightly up and down and we are getting used to carrying all of our staff. Luckily most of the trail was quite flat for the rest of the day. At around km 14 or 15 mark, I was physically exhausted but tried to walk a bit further. 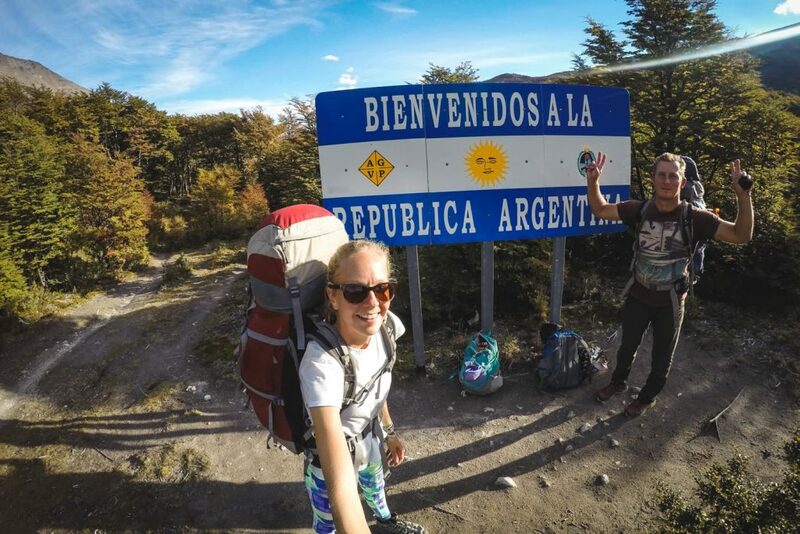 There is a country border at km 16, meaning there’s just sign ‘Welcome to Argentina’. We were walking past the sign and looking for a place to camp. Luckily, shortly after we passed a small lake, we found a flat ground perfect for our tent with a fire pit. And to our surprise, there was even a nice small waterfall behind our campsite (a great source of water!). We cooked dinner, hung out for a bit by the campfire and were also visited by a fox. It was a warm night because we were sleeping in the forest. 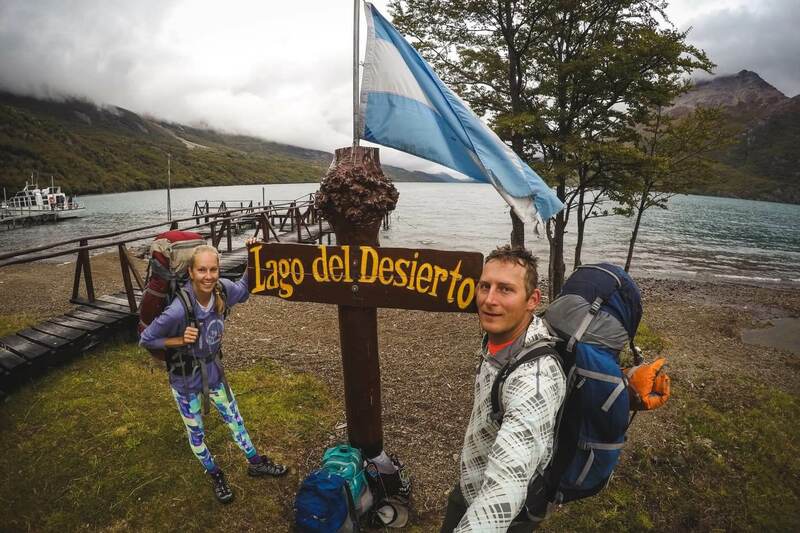 Other travelers who finished the long walk the first day said they were freezing at night camping by the lake. We were carrying so much food that our breakfast wasn’t just some bread which you would assume in the middle of nowhere. We had oatmeal with chocolate, chia seeds, and peaches. You can see that we didn’t let the challenging walking journey limit our food options. 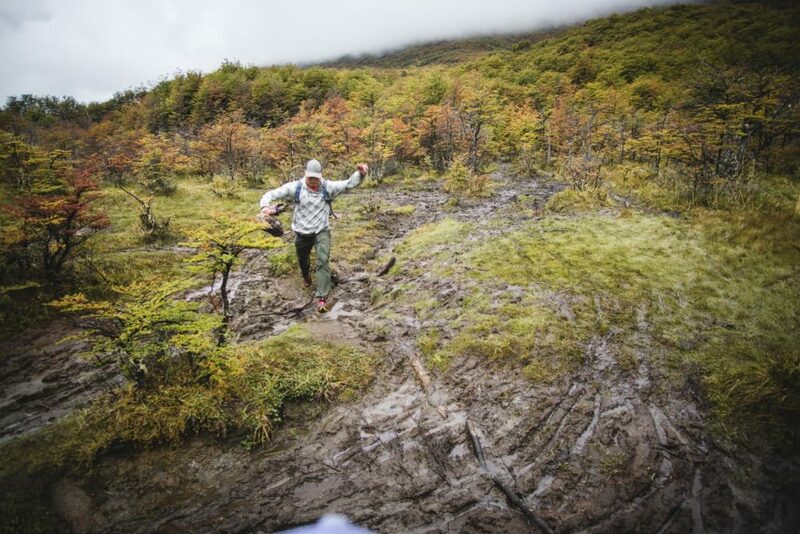 The trail on the Argentinean side was horrendous. 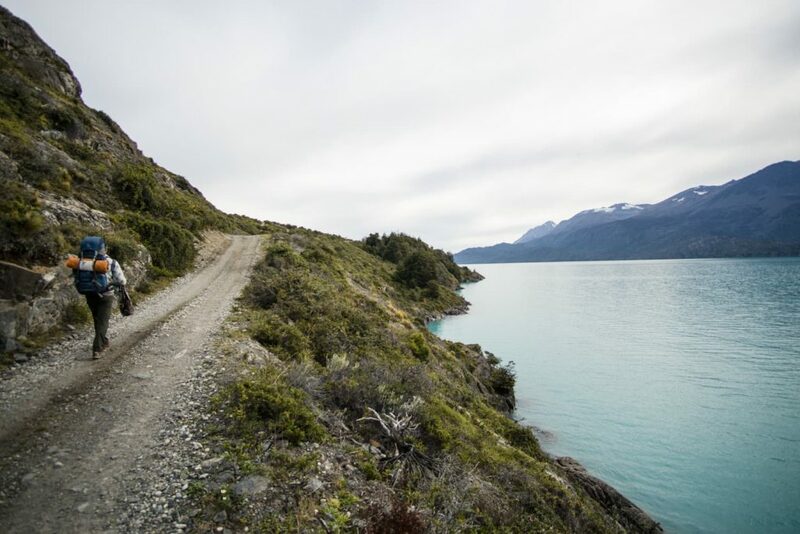 It changed from Chilean gravel road to muddy single track full of slippery roots and rocks. The cyclists who passed us the previous day were walking their heavy bikes now. We had to carefully jump across the muddy spots as well. 4 km later, we finally arrived at the Argentinean immigration office. An immigration officer in sweatpants, shirt with ‘Frontera Argentina’ sign and slippers was greeting us. He stamped our passports and said we were the first Slovak travelers who crossed this border. We waited shortly for the boat, it arrived at 11 am. This is where we got a wakeup call from Chilean prices and realized how prices in Argentina are blown up. We waited to buy a boat ticket on board thinking it might be cheaper (as it usually is without the middleman), but not in this case. For 30 minutes boat ride, we had to pay 30,000 CLP (45 USD) per person and overpaid 14 USD! The boat usually leaves twice per day. If you’re fast enough, you can make the whole crossing in one day. However, the day before we came, the second boat of the day didn’t arrive at all. There were some people stranded with no tents so some cyclists shared their tents. It’s a small lake and the whole ride lasted around 30 minutes. Some people got off the boat in the middle where you can camp and go for a walk on the glacier. If you book the boat ticket with Robinson Crusoe company, the price for 2018/2019 season is 28,000 CLP (42 USD) per person. The price has gone up from 2017 when it was 31 USD but at least you won’t overpay when you pre-book. 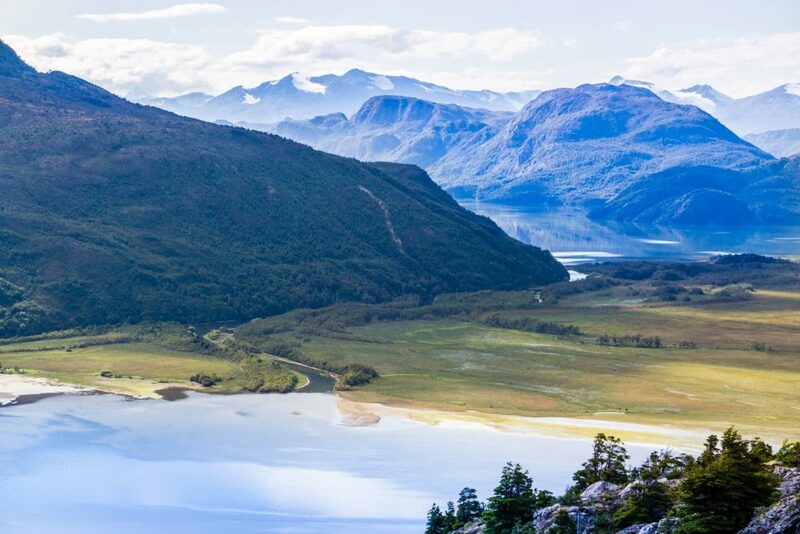 TIP: from our experience, if you travel between Chile and Argentina, book everything you can with Chilean operators, it will always be cheaper. The boat is supposed to arrive at 11am and 5pm every day but don’t count on it, have a tent and a sleeping bag. 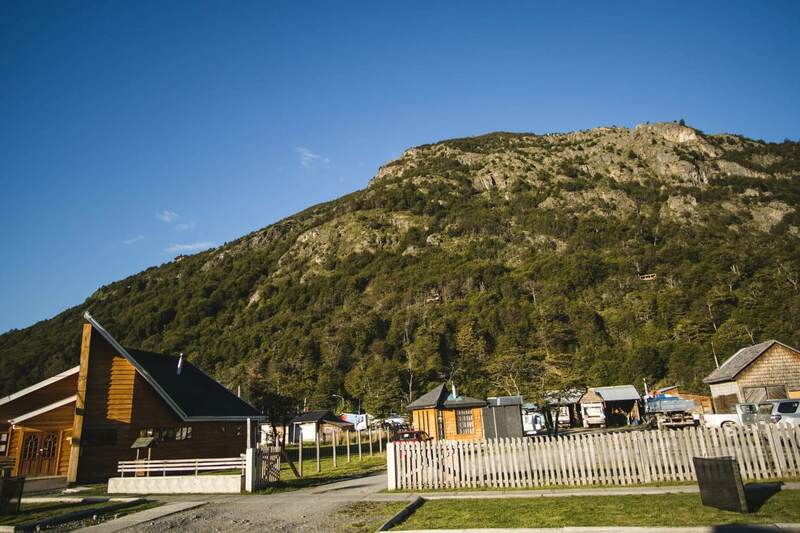 There’s a campsite 200 meters from the port, it’s a departure point for the bus leaving to El Chalten. They have a small shelter and a kiosk where you can buy some snacks or tea. We had a few hours before the bus would arrive and found out it costs 425 ARS (40 USD)! So we tried what we’ve been doing the last two weeks, hitchhike. A van stopped by and gave us and other travelers a ride. Further down the road, we stopped to pick up Austrian hitchhikers as well. They’ve been trekking for a few days and ran out of food. Of course, we still had some Chilean buns left, so we gladly offered them to our hitchhiking friends together with some cheese and chocolate bars. They were happy and we were happy too. We were able to further lighten up our bags and helped fellow travelers in need. 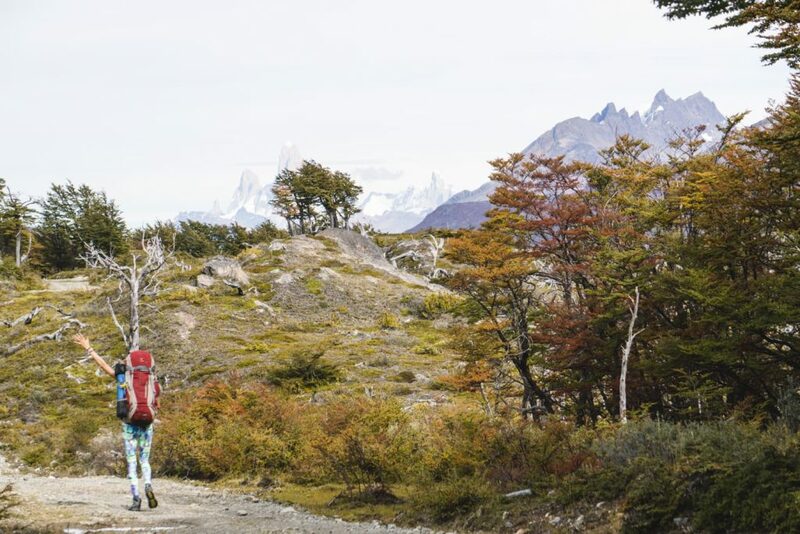 Our driver dropped us off at the beginning of El Chalten and we started looking for a camp. It was quite chilly so we found a campsite with a common room and kitchen inside for just 150 ARS (4USD). After the 1st very cold night, we went to the hostel instead. During our short stay in El Chalten, we’ve encountered many problems with ATM’s, no food in grocery stores and unbelievably high prices. Although the inflation improved, I imagine the prices in Argentinean pesos went up as well. This was the toughest border crossing we’ve experienced. Carrying all your backpacks for more than 20 km is no fun. 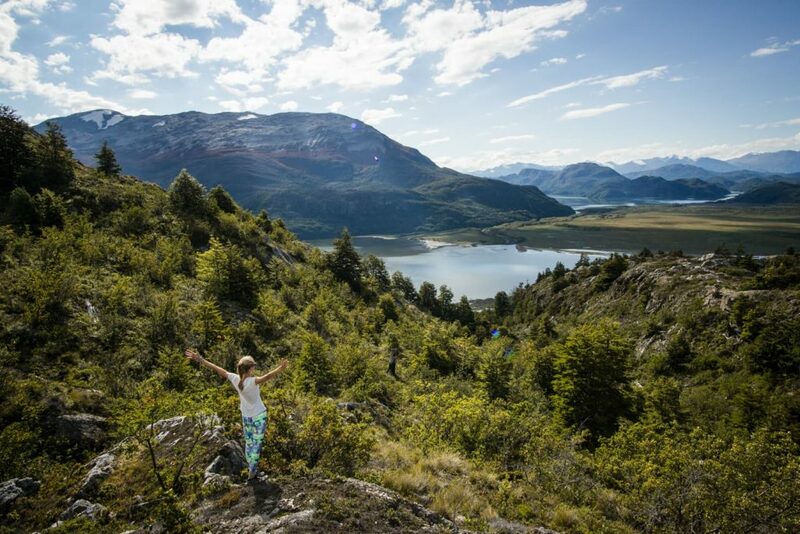 But in the end, we were glad to experience this remote part of Patagonia. 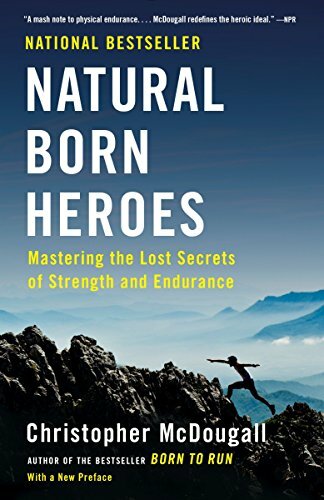 It made us stronger and more resilient for our upcoming adventures. 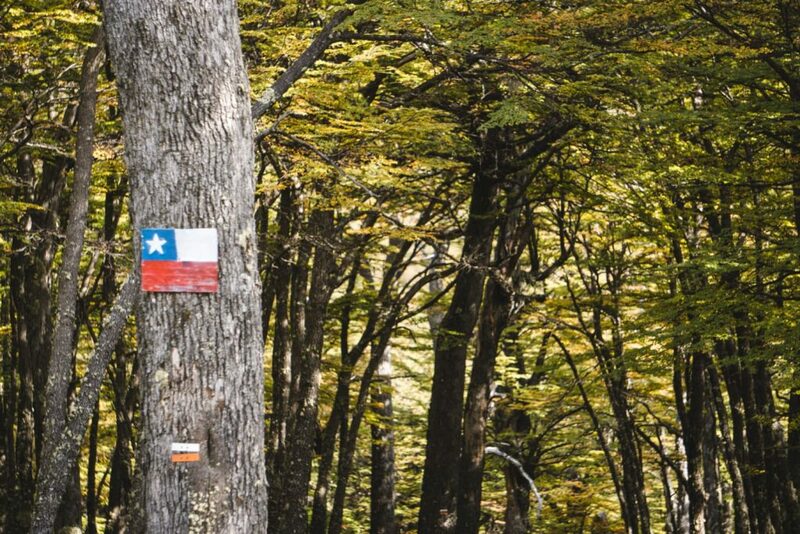 Are you ready for the tough journey from Chile to Argentina? Let us know if you have any questions. 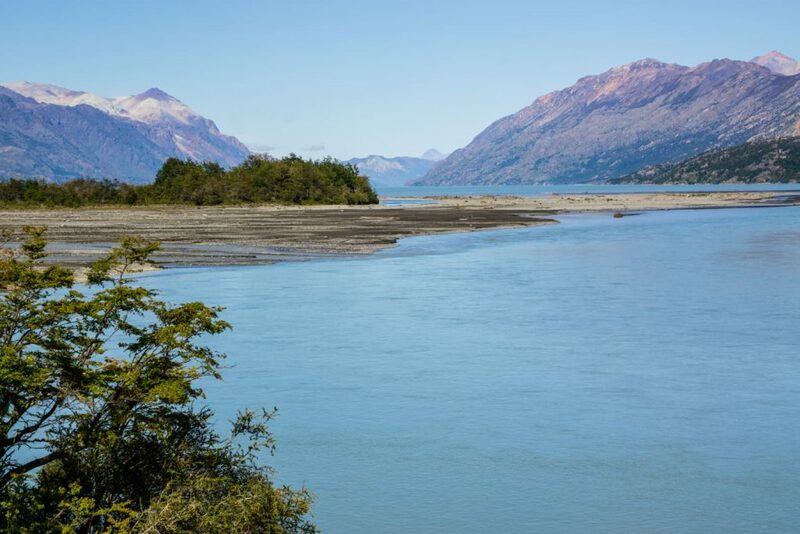 I visited Carretera Austral, but did not make it to Villa O’Higgins. I crossed it in Chile Chico, it is easier but there is no public transport as well, so I carried all my stuff for 7km border crossing and hitchhiked. When I arrived in Argentina, I was shocked by price there. 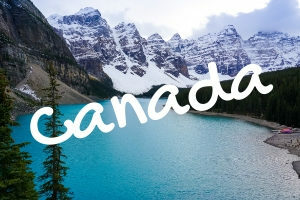 I left after two days because I cannot afford to stay there any longe. Anyway, thanks for this great post. 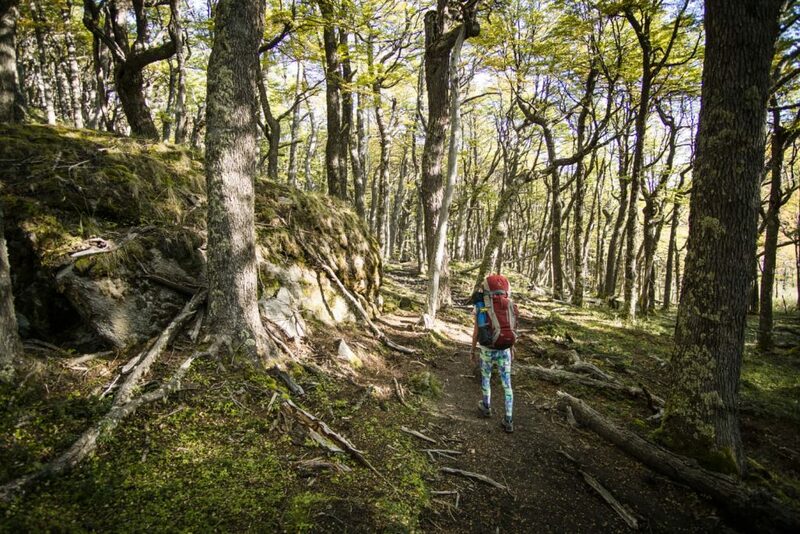 It made me miss Carretera Austral so much! I will definitely visit Villa O’Higgins when I back there. Thanks for reading, Julie. 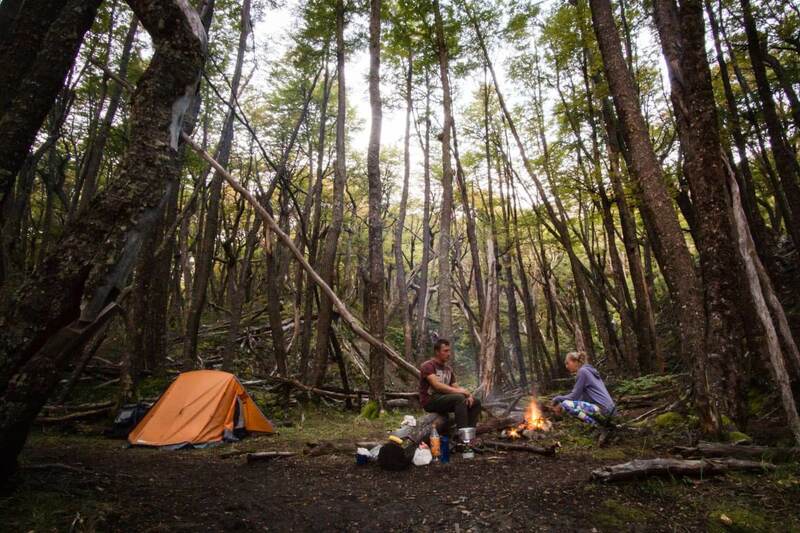 We also can’t wait to visit Carretera Austral and Villa O’Higgins again, such a special place! If we drive from Puerto Montt to Villa O-Higgens, where can we cross the border to Argentina with the rental car? 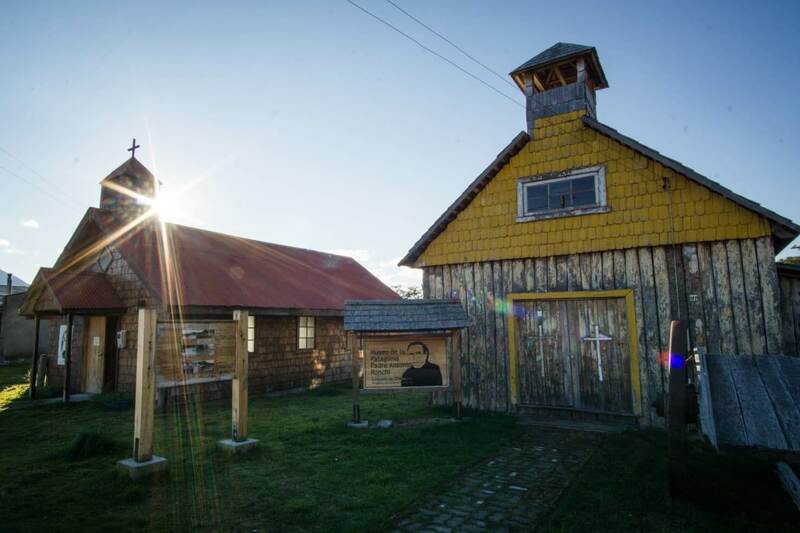 You would need to return to Tortel, take a ferry to Puerto Natales and then cross to Argentina. 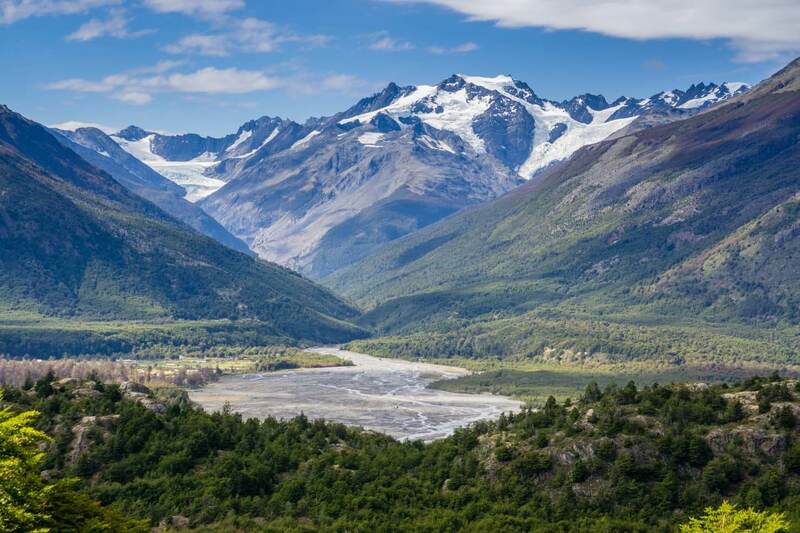 Or another option would be to drive back to Cochrane and cross through Valle Chacabuco. 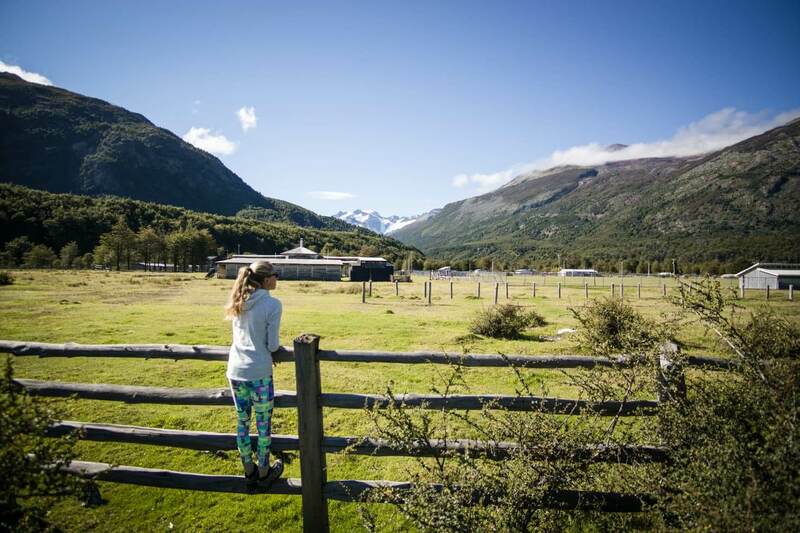 It is not possible to continue from Villa O’Higgins by car, the road ends there. 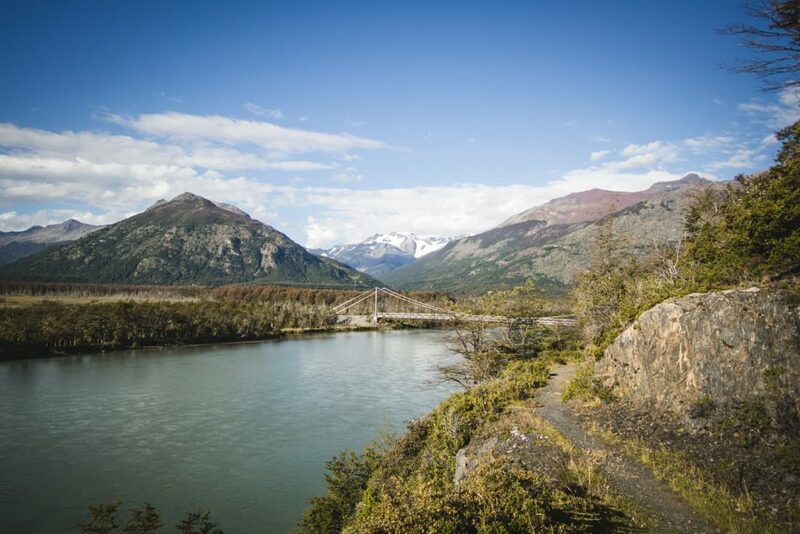 Only hikers or bikers can continue by boat to Argentina.